The words are as true now, as they were when you first posted them. Sometime this weekend (preferably Monday), charge your glass...."Gentlemen...Absent Comrades". The "Flags In" tradition is handled in San Diego by the local Boy Scouts of America. 1500 gathered in the early morning mist of Fort Rosecrans National Cemetary for a brief ceremony and then they are off to the task at hand. It takes apporximately 30-45 minutes to cover this vast cemetary. The site is incredible. The moment is special. It is fitting way of saying "rest easy" to these heroes of battles past. What a wonderful way to begin Memorial Day. A classic...thanks for re-posting it. Happy Memorial Day!! 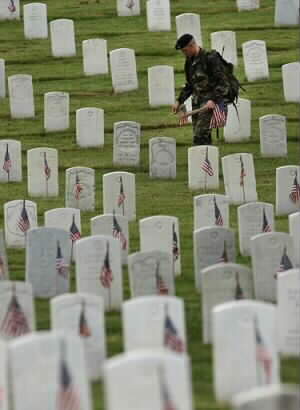 Thank you for the photos of Arlington. 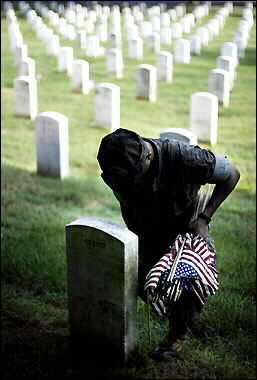 They bring 'Home' more than any words can say. Try to keep them up a little longer. Please. Just THRU Memorial Day.. Sometimes we need a powerful reminder.